There are 68 colleges and universities in the NCAA men’s basketball tournament, all with their own ambassadors roaming the sidelines and the stands—and each mascot has its own story. 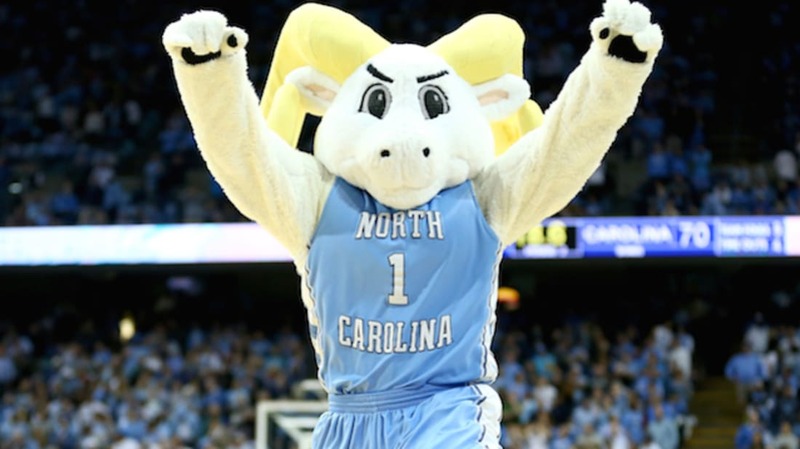 Rameses is both the costumed and live ram mascot for the school. In 1924, the school's head cheerleader was inspired by star player Jack Merrit’s nickname, the “Battering Ram,” and convinced the powers that be to give him $25 to pay for Rameses. Tar Heels comes from the nickname for the state of North Carolina and its inhabitants. For a while it was considered derogatory, and its origin is debated. D'Artagnan is the official costumed mascot, while the Blue Blob serves a “secondary mascot.” Father Francis J. Finn, S.J. proposed the nickname in 1925. The Mountaineer has been around since the mid-1930s. It’s custom for the student to grow a beard to go along with the outfit. The Wildcat started attending games in the 1976-77 academic year. Wildcats became UK’s nickname after a commandant said that the football team “fought like wildcats” after a 1909 victory. 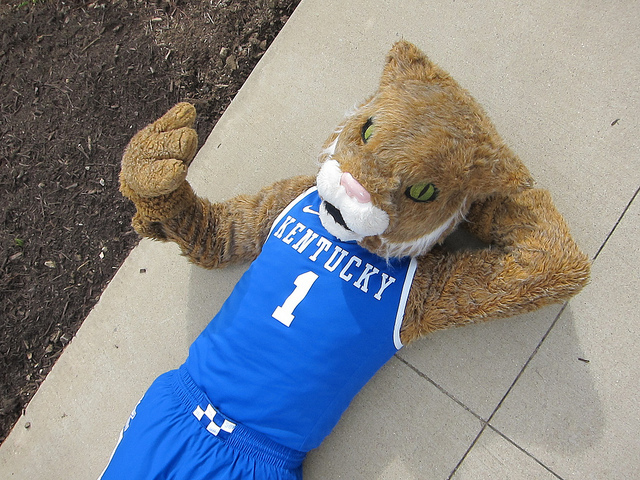 Sometimes Scratch, the more “child-friendly” mascot, joins The Wildcat. Indiana does not have a mascot. They used to be represented by a bison in the late 1960s, but the costume was considered an “embarrassment” to the school [PDF]. A cowboy hat-wearing caricature named “Mr. Hoosier Pride” appeared in 1979, but fans weren’t happy with him either. The etymology of “Hoosier” is debated, but the leading theory is that it was a derogatory term (which has lost its negative meaning over time). The Leprechaun was named Notre Dame's official mascot in 1965, after a series of Irish terrier dogs served the role. They were usually named Clashmore Mike. 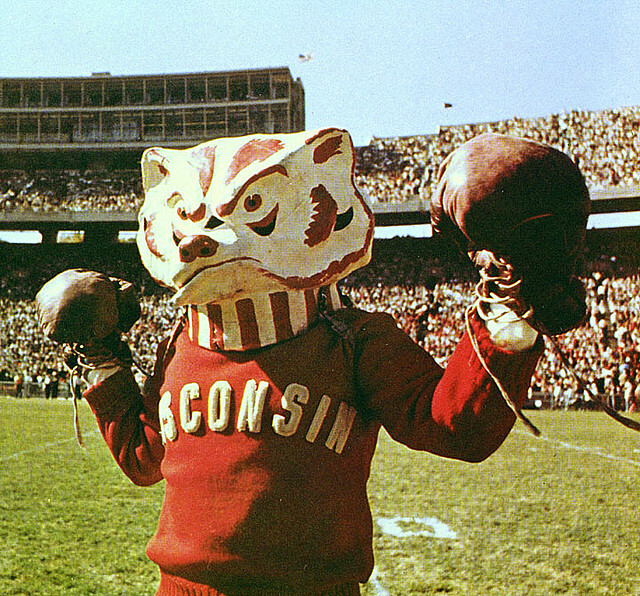 Buckingham U. Badger, better known as Bucky, has a Library of Congress designated birth date of October 2, 1940 (the day that his likeness was officially copyrighted). The nickname Badgers comes from Wisconsin being “The Badger State,” which came from miners in the 1820s “living like badgers” in tunnels to survive harsh Wisconsin winters. Tommy Trojan is a mascot modeled after the Tommy Trojan bronze statue of the same name by Roger Noble Burnham, itself modeled after different USC football players. Starting with the 2013-14 basketball season, Tommy was joined by the costumed horse Traveler (even though traveling is a no-no in hoops.) Traveler's namesake is the live "noble white" horse that has appeared at USC home football games since 1961. The nickname "Trojans" came from Los Angeles Times sports editor Owen Bird, who—at the request of the school's athletic director, who didn't like the current nicknames the Methodist or Wesleyans—picked a new one for them. Friar Dom was listed as one of the eight creepiest college mascots by LIFE magazine. The college’s first few mascots were live Dalmatians, the first named “Friar of What-Ho,” followed by Friar Boys I-V.
Roc the Panther is named after Steve Petro, a former Panther football player who went on to play both professional football and baseball before serving in the Army during World War II. From 1950 to 1972, he was the school’s assistant football coach; in 1973, he was promoted to athletic director (a position he held for 11 years). Petro was known as "the ROCK." The Panther became the university's mascot in 1909 for a few reasons, including the panther being the "most formidable creature once indigenous to the Pittsburgh region," and the "happy accident of alliteration." Michigan does not have a live or costumed mascot. Two live wolverines named Bennie and Biff served as mascots during the 1927 football season, but they turned out to be too dangerous. It was said the two had "designs on the Michigan men toting them, and those designs were by no means friendly." A pair of dogs named Whiskey and Brandy performed at halftime during some games in the 1960s and early '70s in an unofficial capacity. A costumed Willy the Wolverine in the '80s was eventually banned from the football stadium because his seven-foot height blocked fans' views. Michigan students and alumni began referring to themselves as "Wolverines" as early as 1861 for unclear reasons. The university's Bentley Historical Library wrote that a likely explanation was that wolverines were "abundant in Michigan at some time." "Colin Cane, a freshman at The University of Tulsa, worked in IT support at night to help pay his way through college. During an electrical storm one night, Colin was called to the TU sports complex to fix a malfunctioning satellite that was broadcasting a live game. "Never again would he watch his favorite team in action as a mere mortal. As he adjusted the satellite, the roar of the crowd coursed through the transmitter just as it was zapped with static electricity from the storm. Colin became entangled in a web of cyber-athletic forces. "The atmospheric oddity known as a 'binary vortex' mutated Colin over the course of several years. He eventually lost his hair but gained super-human powers. Thus he became Captain 'Cane, a champion athlete and highly educated zealot of all things TU." After realizing their new nickname of "Yellow Jackets" for the 1922 football season was already taken by Georgia Tech (five years earlier), head coach Howard Acher put the name "Golden Hurricanes"—from the initial idea of "Golden Tornadoes," which itself came about after a remark during practice about "roaring through opponents"—to a vote with his team. Scrappy the Mockingbird is named after football coach A.C. "Scrappy" Moore. Before 1997, UTC teams were known as the Moccasins, but now "Mocs" is officially short for mockingbirds, the official state bird of Tennessee. 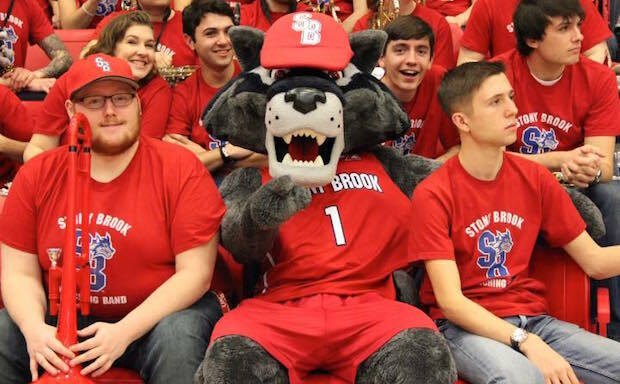 Wolfie the Seawolf is the official mascot for the American East conference champions going to the NCAA men's tournament for the very first time. The school's varsity teams were known as the Soundmen, Baymen, Warriors, and Patriots until 1994, when Seawolves was selected out of more than 200 possible names by a 32-person committee. The Seawolf is a mythical sea creature of the Tlingit tribe. Spotting one is said to bring good luck. The Lumberjack was voted in as the mascot in 1923, shortly after the university opened. A student doesn’t wear a big furry costume, but does have a beard and a fake ax. 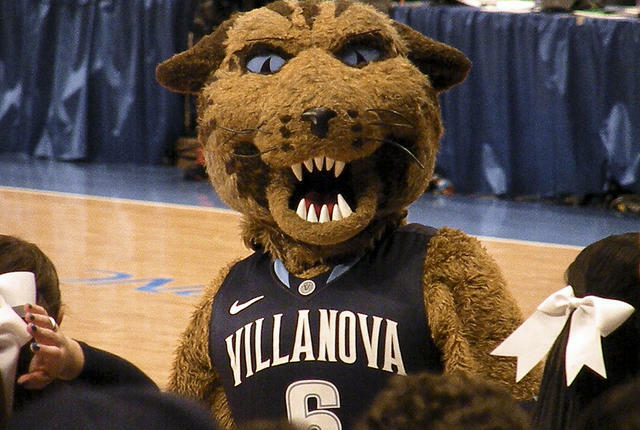 Waldo the Wildcat won 2015's NCAA Collegiate National Mascot Championships. There is a "bit of mystery" surrounding the origins of the nickname. Weber College teams were known as the Weberites until the play of "Wildcat" Morris and the rest of the 1928 football team lead a local sportswriter to claim they were as "scrappy as a bunch of wildcats." The name stuck. Knightro or Nitro is the blue horse mascot for the university returning to the tournament for the first time since 2005. Azul the Eagle represents FGCU. While Azul is from the Spanish word for "blue," the eagle's official colors are emerald green and white, in addition to cobalt blue. Big Jay first appeared in the 1960s, and Baby Jay in 1971, hatching out of a big egg at the homecoming football game. The term "Jayhawk" came from Kansas settlers and combines the blue jay and sparrow hawk. Will D. Cat most closely resembles the bobcat, which the Pennsylvania-based university’s official website admits is usually found in the Southwest United States. Sebastian the Ibis got his name from the San Sebastian Hall residence on the Coral Gables campus, after a student residing there in 1958 performed at games in a homemade Ibis costume. The nickname "Hurricanes" came about thanks to a devastating one postponing the first game of the 1926 football season. The Ibis was considered a mascot beginning in the 1926 school yearbook; the bird is, according to folklore and the university's official website, the last sign of wildlife to go and find shelter before a hurricane, and the first to return after one. Oski the Bear first appeared on September 26, 1941 at the St. Mary's/Cal football contest, after it was decided live bears was no longer a good idea for a mascot. The 5'7" creature is named after the "Oski Wow-Wow" cheer heard at almost every Cal football and basketball game in the early 1900s. Oski can—and has—consumed beverages (with the aid of a straw) through his eye. Testudo came into being in 1932, when Maryland’s football coach recommended the Diamondback terrapin for a mascot, changing the athletic teams’ current nickname of the Old Liners. The origin of the name Testudo is unknown, but it might be due to turtles being reptiles of the order Chelonii, or Testudines. Wilbur T. Wildcat married Wilma Wildcat on November 21, 1986, a little over six months after they met on a blind date. Wilbur first appeared in 1959, gradually taking main mascot duties from Rufus Arizona (a.k.a. Rufus Wildcat), a live desert bobcat. Herky the Hawk was a cartoon character in 1948 before becoming a gold felt feathered costumed mascot in the mid-1950s. The nickname “Hawkeye” might come from the state of Iowa’s nickname, which came from the famous character in the novel The Last of the Mohicans. Chip is the costumed mascot of the school. More well known is the live mascot, Ralphie the Buffalo. "Buffaloes" was the winner of the Silver & Gold newspaper's official school nickname contest in 1934. Jonathan the Husky is named after the former governor of Connecticut, Jonathan Trumbull. A 1933 student survey by The Connecticut Campus student newspaper revealed that the husky dog was the top choice for a mascot. Hooter and Hooter's cousin T-Bird recently welcomed a new live mascot, Stella the Owl, in 2013, for football games. The university went with a nocturnal owl as its mascot because Temple got its start as a night school. Mr. Commodore is also known as Mr. C. Commodore Cornelius Vanderbilt founded the university in 1873 with an endowment of $1 million. WuShock represents the Shockers, named as such after many of the 1904 players on the school’s football team earned money in the off-season by harvesting, or “shocking”, wheat. (Wheaties was the term given to pep club members.) A nameless shock of wheat rooted for Wichita State until a 1948 student newspaper poll produced a moniker. Jack the Jackrabbit was finally given a name at his 105th birthday party on November 12, 2010, after 3956 online votes were tabulated. The nickname "Jackrabbits" started either after a Minneapolis newspaper reporter in 1905 wrote of the football team being as quick as jackrabbits, or came from the new name of the school's yearbook. There is no official mascot for the team. An unofficial mascot, Vili the Warrior, retired in 2012. The legend goes that a rainbow appeared in the sky when the Hawaii Fighting Deans upset Oregon State in a 1923 battle. The nickname "Rainbow Warriors" came about soon after. Victor E. Bull was first partnered with his sister, Victoria S. Bull, in 2001. A 175-pound bison head known as “Boscoe” was the first mascot, but his current whereabouts are unknown. Rocky the Bulldog was first known as Puck (from A Midsummer Night's Dream), then Chug-a-Lug, then Winston (after Winston Churchill). A 1995 contest resulted in the name "Rocky," a tribute to Rocky Balboa. Governor Peay X recently won reelection as school mascot, with the challenger The Gov settling in a Lt. Governor position. It was reported in January that despite the election results, The Gov has attended most of the men's and women's basketball games, with Governor Peay X missing in action. The university is named after former Tennessee Governor Austin Peay, who signed a law establishing the Austin Peay Normal School in 1927. CavMan has been around since the 1984 football season. “The Cavalier Song” was determined to be the best fight song entry in a 1923 college newspaper contest, inspiring the nickname. Sparty is seven-feet tall, and the costume weighs 30 pounds. In a 1925 contest, “The Michigan Staters” won out to replace the nickname “Aggies,” but the Lansing State Journal sports editor used “Spartans” instead. Swoop is a red-tailed hawk that first appeared on the Salt Lake City campus in 1996. The University says that their nickname “Utes” is used with the Ute Tribal Council’s permission. Cy the Cardinal debuted at the 1954 Homecoming game, and a student was chosen “out of pity” to be the first person to wear the costume after he was cut from the basketball team. He missed a year when, in 1961, Cy was “plucked to death” during a migration to Missouri. The Boilermaker Special—a vehicle outfitted to look like a Victorian-era steam engine locomotive—is the official mascot. The Boilermaker nickname came from an 1891 Crawfordsville, Indiana newspaper article documenting Purdue’s 44-0 football victory over Wabash College titled “Slaughter Of Innocents,” where Purdue was referred to as “Burly Boiler Makers.” There's also Purdue Pete, who was dreamt up by the University Bookstore in 1940 to help promote business, and started going to games in 1956. Pete’s head once flew out of the back of The Boilermaker Special and was never found. The Pirate doesn't have a proper first name. When Seton Hall came back from a four-run deficit in the ninth inning of the April 24, 1931 game against Holy Cross, a local sportswriter at the game yelled, "This Seton Hall team is a gang of Pirates!" Rudy Flyer is a pilot who wears vintage goggles and a pilot's helmet. The nickname "Flyers" and Rudy Flyer’s name are tributes to the Wright Brothers. 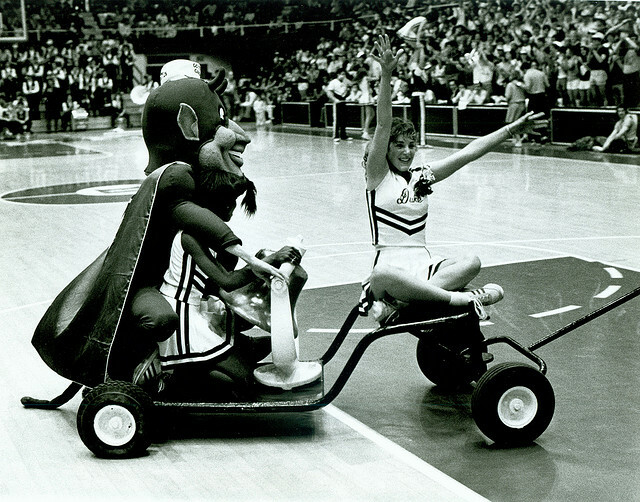 Raider Red came into existence when the Southwest Conference forbade live animal mascots, such as Texas Tech's the horse-riding The Masked Rider, from attending away games in the early 1970s. Raider Red came about from a drawing by cartoonist (and former mayor) Dirk West. 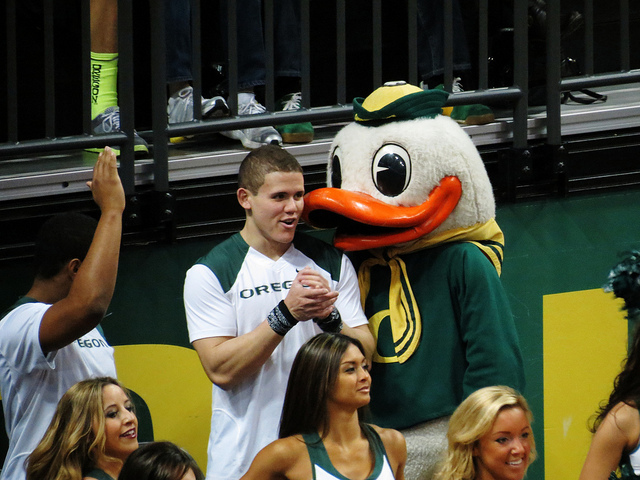 While Red rocks boots at football games, he changes to high-top court shoes for basketball games. Texas Tech teams were known as the "Matadors" from 1925 to 1936, until a reporter referred to the football team as the Red Raiders and the name caught on. Butler Blue III is currently their live bulldog mascot. The original nickname “Christians” changed in 1919 after a bulldog owned by one of the fraternities walked into the college paper’s office as they were trying to think of a way to inspire the student body before a big game. Otto the Orange was almost "Opie the Orange." In 1990, after two previous orange costumes were known as "Clyde" and "Woody," the school's cheerleaders voted on Opie over Otto because Opie rhymed with "dopey." 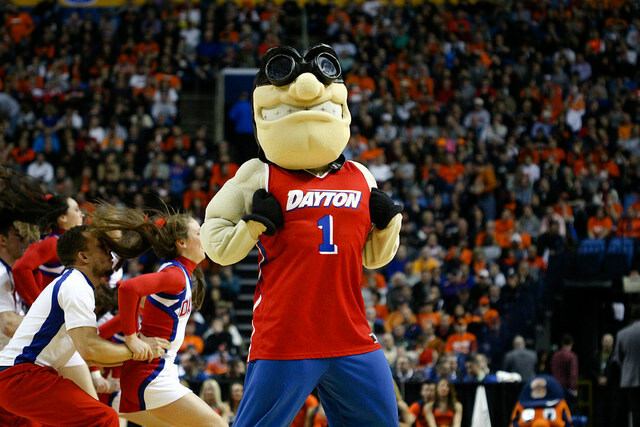 Otto became the official mascot in 1995. Syracuse's colors were pink and blue until the class of 1890 were too embarrassed to celebrate an upset track meet victory because their colors were "the pale kind you use on babies' what-do-you-call-thems." It turned out that the color orange alone was not claimed by any university. The Trojan, the mascot for the Sun Belt conference tournament champions, is named Sporticus. Killian the Gael represents the college founded in 1940 by the Congregation of Christian Brothers. As Iona's website says, Killian is a "spunky" character "consistent with the school motto, certa bonum certamen," which translates to “fight a good fight." TimeOut first appeared in the 1970s. The live mascot is Victor E. Bulldog. The nickname "Bulldogs" came about in 1921, when a white bulldog frequently visited Fresno State students outside the main campus. Lightning is a Pegasus. Born in 1998, Lightning "symbolizes the University's Aerospace program and Middle Tennessee's heritage in the Walking Horse industry," according to the university guide for parents. Previous mascots were Confederate Army Lt. General Nathan Bedford Forrest, and a hound dog named "Ole Blue." The 1934 local newspaper submission of "Blue Raiders" was a modified version of Colgate University's "Red Raiders". The Pirate won out as the mascot of Hampton University over Seasiders, Ironmen, Buccaneers, and Wildcats in a 1933 vote. The Oregon Duck is based on Donald Duck, thanks to a licensing agreement with Disney. The school used to use Puddles, an actual duck, as well as his progeny, until the early 1940s. Reveille was a dog that was either hit by a Model T driven by a group of A&M cadets in January 1931, or a dog found by cadets on the side of a road. The dog was brought back to campus for care, and when she heard the bugle call of "Reveille" the following morning, she barked. If the current Reveille—the female collie Reveille IX—sleeps on a cadet's bed, the cadet must sleep on the floor. And if she barks in the middle of a class, the class is immediately dismissed. A&M College was known as the "Farmers" with a lion as their mascot until after World War I. The Blue Devil was one of many nominees in a 1921 contest to determine a university nickname. The contest ended with no conclusive winners, but the student newspaper started to refer to the university’s teams as the Blue Devils anyway, and it eventually caught on. It was inspired by the Chasseurs Alpins, a group of blue cape- and beret-wearing French soldiers, who were nicknamed "les Diables Bleus.” They were known for their courage during World War I, and even raised money in support of the war effort in the United States. Judge “Joy” Reynolds and Judge Sue Sloan, or “Lady,” are bears named after the wives of the 11th and 12th school presidents, respectively. 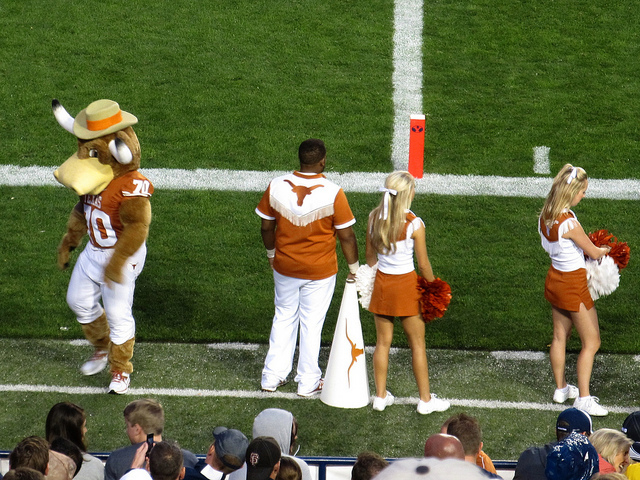 The costumed mascot is Bruiser the Bear. Bears were voted as the mascot in 1914 by Baylor students. Benny Beaver was the successor of a coyote named Jimmie, "Doc Bell", and "Bevo" the live Beaver. Benny made his debut to the student body on September 18, 1952. Oregon State teams were known as the Aggies, then the Orangemen because of their new orange uniforms, then the Beavers when the 1916 school yearbook was renamed "The Beaver." Oregon designated the beaver as the official state animal in 1969. The Hawk was named "Best College Basketball Tradition" by NCAA.com in 2014. The original costume cost $120 and was first used on January 4, 1956. The Hawk constantly flaps its wings throughout every game to represent the school motto, "The Hawk Will Never Die." "Hawks" has been the nickname since 1929, edging out "Grenadiers" in a student body vote. The Bearcat, at least in name, originated on Halloween 1914 in a football game against Kentucky. A Cincinnati cheerleader turned fullback Leonard K. “Teddy” Baehr’s last name into a pun by shouting: "They may be Wildcats, but we have a Baehr-cat on our side." The use of the word “bearcat” to mean a forceful person with great energy began in the 1910s. Rodney the Ram replaced a Green Devil in 1963. His co-workers in the past have included Rhonda the Ewe and Air Rodney. TC Panther became better known as “The Cat” in the mid-1980s—hence the TC. Initially, in the 1930s, his first name was Pericles. Handsome Dan was a bulldog purchased from a New Haven blacksmith by a Yale student back in 1889. Currently there is both a costumed dog and live dog—Handsome Dan XVII. Sammy C. Hawk is the costumed seahawk representing the Colonial Athletic Association school. Sammy got his name after a 2004 student newspaper contest. The nickname "Seahawk" came about in 1947 from a five-man student council, due to the popularity of the Iowa Pre-Flight Seahawks, who represented the U.S. Navy pre-flight school at the University of Iowa at the time, and because of the campus' proximity to the water. Phlash the Phoenix was christened as such in 1979, when its new costume was the first that did not scare little children. Phoenix received only 125 of the 577 votes tallied in the school's new nickname naming contest in May 1970, yet was announced as the winner. There is a belief that the "Fighting Tomatoes" really won, but was disqualified by judges because they thought it was a joke. Rowdy the Roadrunner was reported missing in 2008, only to be discovered in the training room under approximately 15 boxes of Gatorade ice chests. Iggy the Crusader, full name Ignatius T. Crusader, was almost James the Crusader, if the final round of a three-week naming contest went a different way. Lacumba is a costumed jaguar, based off of two deceased live jaguars. Lacumba means "Heart of Africa." An earlier version of this story ran in 2015.